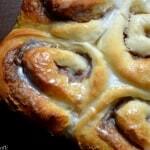 Home » Baked Goods » Potato Cinnamon Rolls: Soft and Fluffy! Potato Cinnamon Rolls: Soft and Fluffy! You know that gut feeling you get when you come across a recipe that you know will be spectacular? Well, I got that feeling when I came across this recipe for easy mashed potato cinnamon rolls. I was more than slightly intrigued when I initially read the list of ingredients for this recipe. Potatoes in cinnamon rolls! I then thought, why not right? Gnocchi is made with potatoes, and so are some rolls and biscuits. I couldn’t wait to get home and try this recipe! It all begins with mixing yeast, flour, sugar, milk, butter, eggs and the secret ingredient: potatoes. If you have one, use a potato ricer to mash your potatoes. Be sure not to overwork the dough. Once the dough has rested and doubled, poke it gently with two fingers. If the indentations remain, you are good to go. Turn it out on a lightly floured board and let it rest for about 10 minutes. While you wait, you can get started on the cinnamon sugar mixture. Roll out the dough in a rectangle measuring 12 x 18 inches. As you can tell, mine is less than perfect. Brush with melted butter and spread the cinnamon sugar mixture. I read somewhere that including a little bit of flour in the mixture will prevent it from “leaking”. I usually add about one heaping tablespoon. This is such a nice dough to work with. Soft and a little sticky. Starting at the long end, roll it up as tight as you can, and then slice it. I like to use my handy little dough scraper to cut through the dough. I don’t mind squishing the dough. If you want perfect slices, you can use floss or kitchen string. (Place string under the log and as you bring the two pieces of string across each other (on the top), you cut through the dough perfectly every time). A sharp knife can also be used. Cut in half, then cut the halves in half, and then the quarters in thirds. I had to cut one section in four as it was slightly longer than the other ones. Vive la différence! Okay, so now you pick up these wonderful little babies and place them ever so gently in a large baking pan (13 x 9 x 2 inches). Remember to grease or spray your pan. Now, comes the hard part: waiting! Wait until the dough doubles in size. Place in a preheated oven for about 30 minutes. Not bad,eh? I probably should have rolled my log a little tighter. There’s my excuse to make them again. 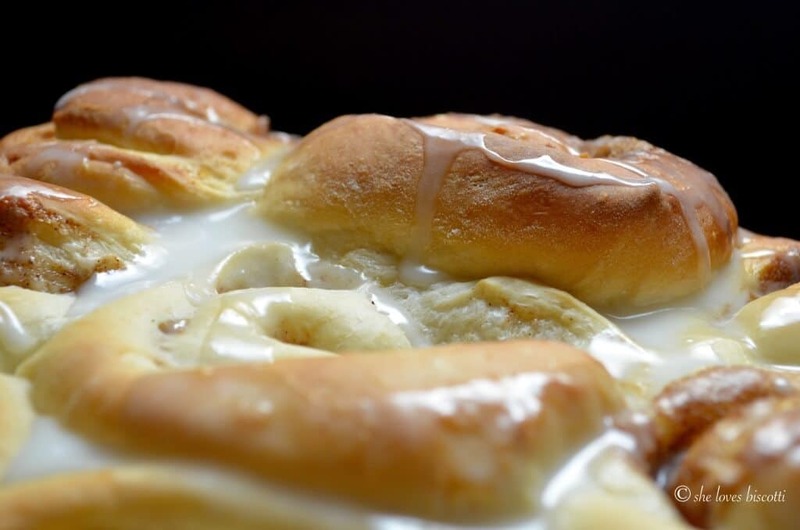 A little drizzling and you’re all done… Easy Mashed Potato Cinnamon Rolls! For those of you with touch screens, zoom into this picture…doesn’t it look soft and tender? So, if you are like me, you would want to know about the magical culinary powers of potatoes. I read that the starch in the potatoes (which is higher in Idaho or Russet potatoes) contributes to the structure of the dough, and holds more moisture than wheat flour. And all of this is done without contributing to the development of gluten. That’s why the end product turns out to be light and tender. As I mentioned in my popover post, there is chemistry in baking! A few years ago, I bought a magazine from Better Homes and Gardens called “Cook’s Secrets”. I’ve adapted this recipe from there. Everything I’ve tried (so far) from this magazine has been spectacular. If you are looking for the best make ahead breakfast recipes for a crowd, this is the recipe for you. Every time I make these easy mashed potato cinnamon rolls, I can’t decide if I have more pleasure making or eating them. What about you? 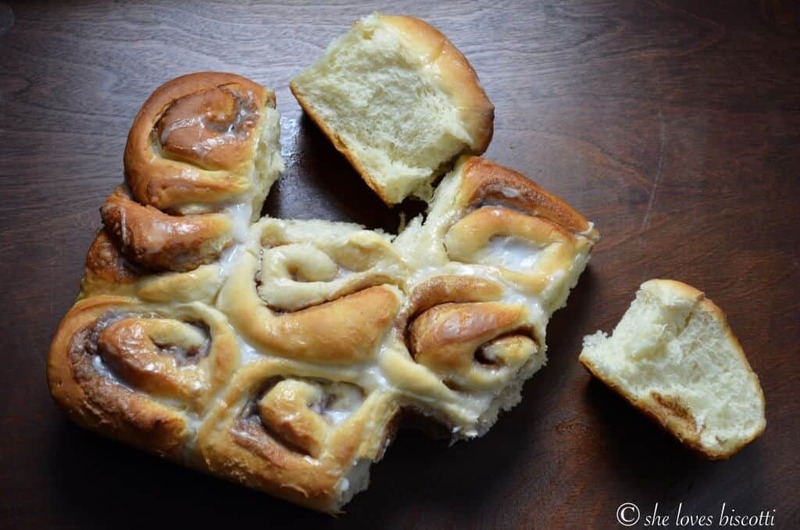 ★★★★★ If you have made this recipe for Potato Cinnamon Rolls, I would love to hear about it in the comments below and be sure to rate the recipe! You have just found the world's best recipe for soft, homemade Easy Mashed Potato Cinnamon Rolls. This amazing recipe can also be made ahead of time and refrigerated or frozen until required. Hard to believe, but true. In a large mixing bowl (of stand mixer) combine 1 1/2 cups of flour with yeast. Set aside. Add eggs and continue beating until well incorporated (2-3 minutes). Scrape down sides of bowl. Meanwhile, combine brown sugar, cinnamon and flour in a small bowl. Set aside. Also, prepare pan (13 x 9 x 2 inches) by greasing or spraying with non-stick spray. Brush the surface with melted butter and evenly sprinkle the cinnamon sugar mixture. Brush the top of roll with melted butter. Cut the roll into 12 slices. Cover with plastic wrap and let rise for about 30 minutes or until double in size. Cool slightly before drizzling with icing (if using). Icing is optional: I like to combine a 1/2 cup of icing sugar with about 1 tablespoon of milk. Whisk until smooth and glaze the rolls before serving. Make it ahead:Once the rolls have been cut and placed in the pan, they can be refrigerated overnight. Remove from fridge and let stand at room temperature (covered) for about 30 minutes before baking (as per instructions). I am used to mixing dry active yeast in warm water and leaving it to completely dissolve and foam. Will the method of this recipe have the same result? That’s what I usually do as well Leslie but you will see this method works for these Cinnamon Buns! Hope you get a chance to try them. Thanks for stopping by! Hi I was wondering if I can make this as a loaf of bread insteadof rolls? Increase in rise or baking time? Yes, that is what I would do… look for a rise double in size; I would assume tagging on 10 minutes for the baking time. If you find the top getting to dark, cover lightly with a foil sheet. 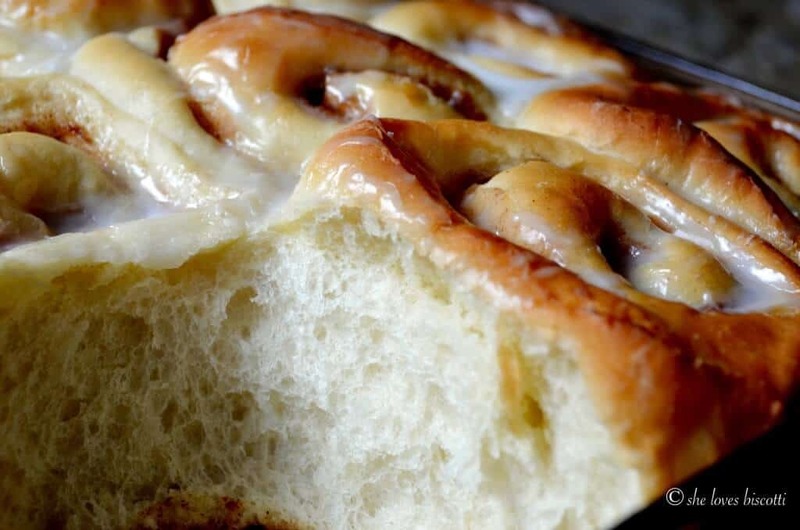 You might be able to get 3 nice sized loaves from this cinnamon rolls recipe. Great comment! Thanks for stopping by Temple. I am in tears. Growing up my Baba made potato doughnuts and these are taking me back to her kitchen. Thank you for sharing. I added a sticky bun glaze to the pan and increased the cinnamon to 1Tbsp. Absolutely scrumptious! Thanks so much for your kind words Cheryl ♥ This is one of my favorite recipes… I’m so glad it brought back some happy memories! Appreciate you taking the time to share. I’ve been looking for a recipe with potatoes in the ingredients. Thank you, I can’t wait to try them for our traditional Christmas morning Cinnamon Rolls. I usually make them ahead and freeze, can I freeze this recipe? It helps to keep things running smooth for the holidays. So good. This was my first attempt to make cinnamon rolls and I did it!!! They taste AMAZING!! Can I substitute instant potato’s ? If so how much and do I need to increase the liquid etc..? Hi Donna, although I have never tried it, I do not think it would work. Appreciate your comment. Have a great day! This recipe makes incredibly soft, delicious cinnamon rolls. Perfect in my book. These were THE BEST cinnamon rolls ever!!. Hubby could not stop eating them. OK me too. I am so glad you enjoyed them Althea. The exact same thing happens with me 😉 Appreciate you taking the time to comment. Have a great week-end! Now that I am at the 5000 foot elevation, I can safely say that I made NO adjustments to any of the ingredients. Recipe worked just fine at 5000 feet. I have already made these 2; no, 3 times already and hubby is asking for them again. 😉 Hurray…cinnamon rolls again!!!!! I’m particular about taste and texture. These cinnamon rolls were absolutely delicious (increased the filling the second time around ). I make these at least twice a month and everyone devours them! Thank you so much for this great recipe!! I’m so glad you enjoyed these 🙂 Appreciate you taking the time to comment, thanks Phyllis. I made these as a gift to my brother for Christmas. Turned out beautifully. Thank you. Amazing recipe and soooo delicious. This recipe was a hit with the family and the cinnamon rolls were gone in a flash! So happy you and your family enjoyed the rolls! Appreciate your comment,thanks!! !